The global standard in abrasion resistant chromium carbide plate. CHROMEWELD 600 is a 600 Brinnell chromium carbide plate that is manufactured by JADCO and is ideal for surfaces requiring high levels of abrasion resistance. Precision-manufactured with a mild steel (A36) base plate and hardfaced/overlayed with our proprietary wire, CHROMEWELD 600 is a premium grade of chromium carbide plate. Alternative options available for the base plate, including but not limited to: A572 and stainless steel. CHROMEWELD 600 has been proven in the Coal mines of Appalachia, the aggregates of North Carolina, and the Gold fields of Africa. Learn how CHROMEWELD 600 can solve your unique abrasion challenges. 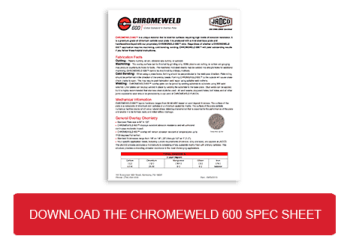 Regardless of whether a CHROMEWELD 600 application requires machining, cold bending, welding, CHROMEWELD 600 will yield outstanding results if you follow these helpful instructions. CHROMEWELD 600 typical hardness ranges from 58-62 HrC based on weld deposit thickness. The surface of plate is a composite of chromium iron carbides in a chromium austenitic matrix. The surface of the plate exhibits numerous hairline cracks which are a natural stress relieving phenomenon that is essential to the performance of the plate and enable it to be formed, bent, and rolled without damage. The surface of plate is a composite of chromium iron carbides in a chromium austenitic matrix. Typical hardness of the CHROMEWELD 600 is 58-62 HRC, depending on the thickness of the overlay. Standard plate sizes are 90” X 120” and 96" x 240". Custom sizes available upon request, please contact us directly for more details. Base plate options include (but not limited to): A36, A572, and Stainless Steel. 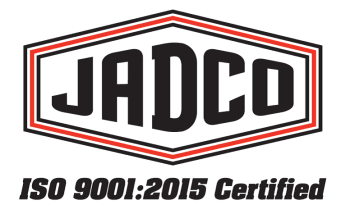 For more information or other options, please contact your JADCO sales representative. CHROMEWELD 600 displays excellent abrasion resistance and will withstand continuous moderate impact. CHROMEWELD 600 overlay will remain abrasion resistant at temperature up to 1100 degrees Fahrenheit. Standard thickness range from 1/8” on 1/8” (.25”) through 1/2” on 1” (1.5”). Custom plate thicknesses available, JADCO can manufacture plate to your specific application. The JADCO process produces a microstructure consisting of fully austenitic matrix filled with primary carbides. This structure provides outstanding abrasion resistance in the most challenging applications.